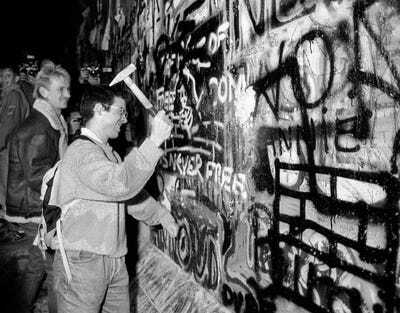 FAB/ReutersA man hammers a section of the Berlin Wall near the Brandenburg Gate after the opening of the East German border. 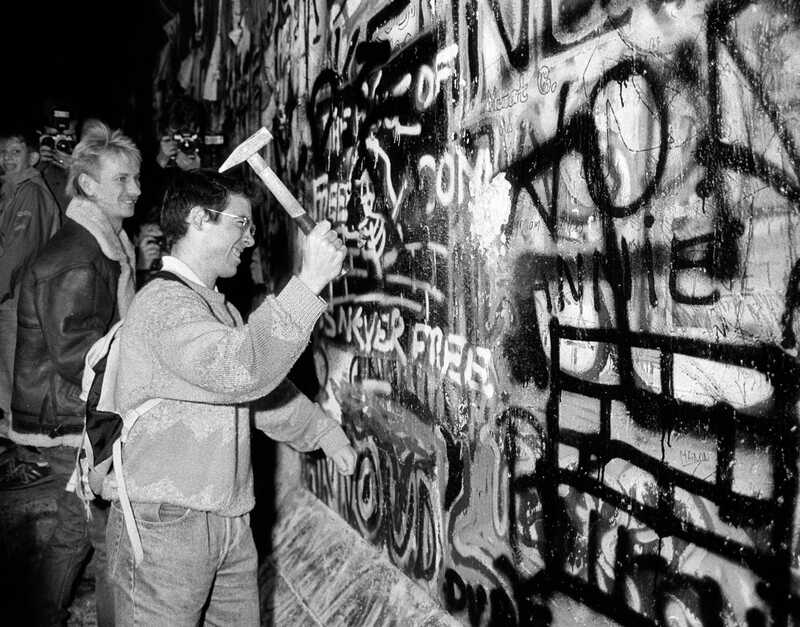 In this excerpt from The Berlin Wall: A World Divided, Frederick Taylor, a German historian, describes the moments leading up to the fall of the Berlin Wall by weaving together history, archival materials, and personal accounts. 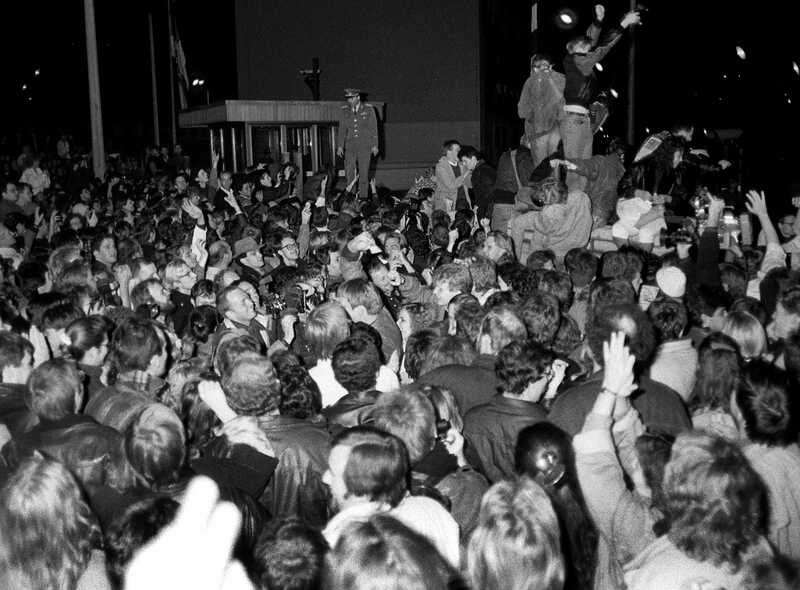 At around 11:30 p.m, a group of East Berliners pushed aside the screen fence in front of the border crossing and everyone swarmed into the checkpoint area en masse. Checkpoint commander Lieutenant-Colonel Harald Jäger decided that he was not prepared to risk the lives of himself and his soldiers. He ordered his men to stop checking passports, open up fully, and just let the crowd do what it wanted. And the crowd knew what it wanted. Within moments, thousands began to pour through the checkpoint. They simply walked or, in most cases, ran into West Berlin. The sensation of running freely over the bridge, of crossing a border where such an action, just days or even hours before, would have courted near-certain death, brought a surge of exhilaration that, if we are to believe those who were there, all but changed the chemical composition of the air and turned it into champagne. 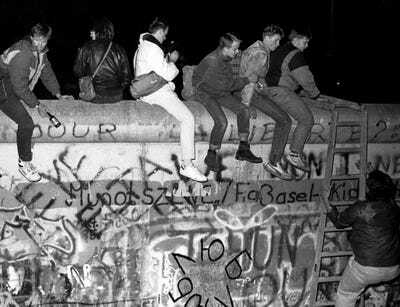 FAB/ReutersWest German citizens sit on the top of the Berlin wall near the Allied checkpoint Charlie after the opening of the East German border was announced in this November 9, 1989 file photo. Large crowds had already gathered on the Western side. They greeted the Easterners with cries of joy and open arms. Many improvised toasts were drunk. By midnight, all the border checkpoints had been forced to open. At the Invalidenstrasse, masses ‘invaded’ from the West and met the approaching Easterners in the middle. 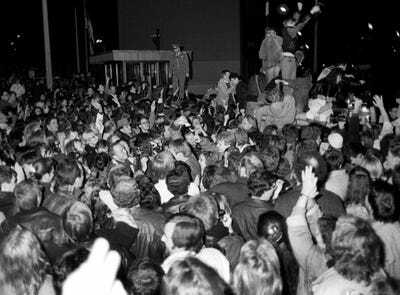 FAB/CLH/ReutersThousands of West Berliners welcome East Berlin citizen which cross the border at the Allied checkpoint Charlie after the opening of the East German border was announced in this November 9, 1989 file photo. It was now twenty past midnight, and the entire East German army had been placed on a state of heightened alert. However, in the absence of orders from the leadership, the 12,000 men of the Berlin border regiments remained confined to barracks. The night passed, and the orders never arrived. 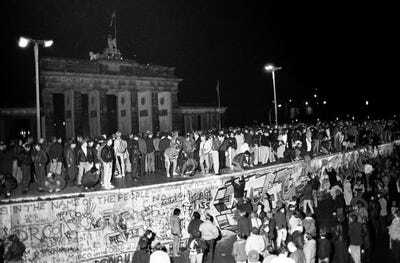 Between one and two a.m., human swarms form East and West push their way through the Wall at the Brandenburg Gate. Some are still in their sleepwear, ignoring the November cold. Thousands luxuriate in the sensation of walking around the nearby Pariser Platz — embassy row — an elegant city landmark closed for thirty years by barbed wire, concrete blocks and tank traps, turned by state decree into a deadly no man’s land. People are clambering on top of the Wall to caper and dance and yell their hearts out in liberation and release and delight. 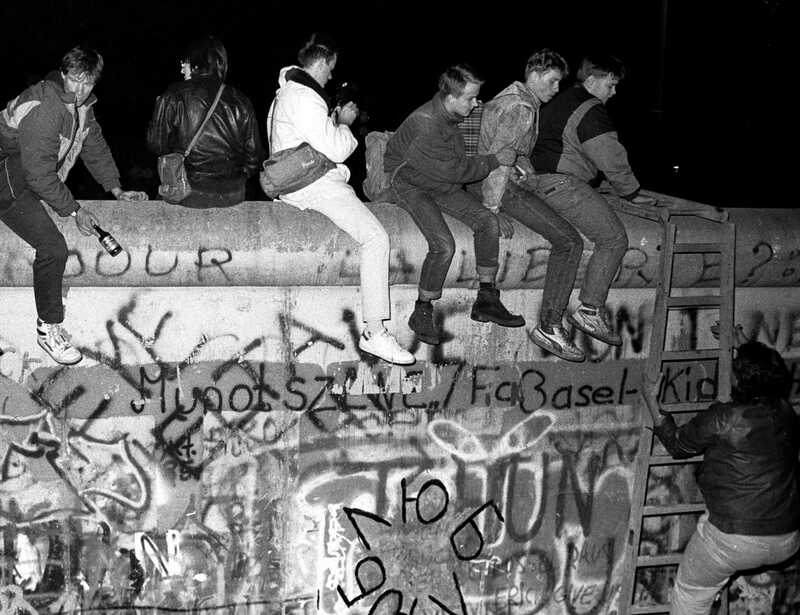 FAB/ReutersEast and West German citizens celebrate as they climb the Berlin wall at the Brandenburg gate. A mix of hype and hope has defeated bureaucratic obfuscation. A little over six hours after a fumbled press conference and a Western press campaign that took the fumbled ball of the temporary exit-visa regualtion and ran with it, a revolution occured. 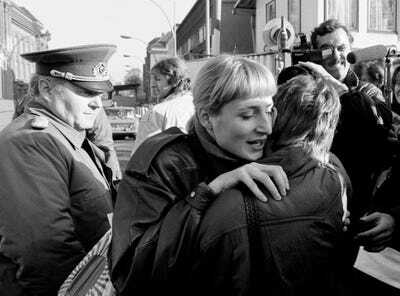 Fabrizio Bensch/ReutersAn East Berlin citizen embraces a West Berlin woman while an East German border soldier watches on at the border checkpoint Invalidenstrasse after the opening of the East German border was announced in Berlin, November 9, 1989. One of the swiftest and least bloody in history. 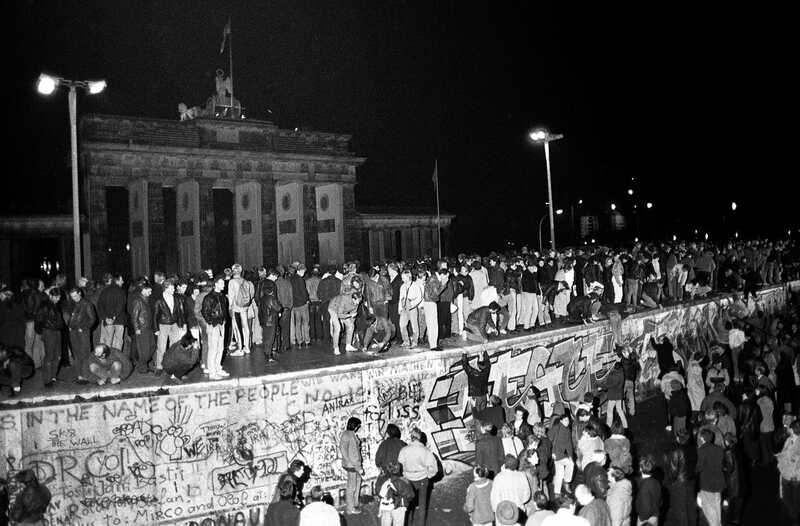 The fall of the Berlin Wall, like its construction, took place in a single night. Just as on 13 August 1961, a city and a people awoke to find themselves divided, so on the morning of 10 November 1989 that division was no more. Although, how many people actually woke up to this relevation is debatable, since during that night in Berlin many had not slept a wink. Excerpted from The Berlin Wall: A World Divided by Frederick Taylor, (HarperCollins Publishers, 2006). Excerpted with permission by Frederick Taylor.